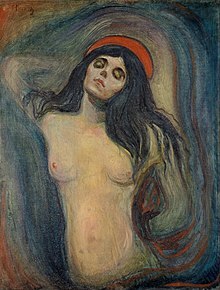 Edvard Munch (12 December 1863 – 23 January 1944) was a Norwegian Symbolist painter and printmaker, and an important forerunner of the Expressionistic art movement. Life here [in Paris, 1885] is quite different. You hardly ever see a dog on a lead; you come across little wagons being pulled by dogs that are often so small that you can't imagine how on earth they manage to shift such enormous weights. You see shepherdesses in the middle of the street herding goats and sometimes playing on their flutes. I think I'll go to the Louvre and the Salon today. I thought I should make something – I felt it would be so easy – it would take form under my hands like magic. When seen as a whole, art derives from a person's desire to communicate himself to another. I do not believe in an art which is not forced into existence by a human being’s desire to open his heart. All art, literature, and music must be born in your heart’s blood. Art is your heart’s blood. By painting colours and lines and forms seen in a quickened mood I was seeking to make this mood vibrate as a phonograph does. And I live with the dead – my mother, my sister [Sophie], my grandfather, my father [who died in 1889, when Munch was in France].. .Every day is the same – my friends have stopped coming – their laughter disturbs me, tortures me.. ..my daily walk round the old castle becomes shorter and shorter, it tires me more and more to take walks. The fire in the fireplace is my only friend – the time I spend sitting in front of the fireplace gets longer and longer.. ..at its worst I lean my head against the fireplace overwhelmed by the sudden urge – Kill yourself and then it’s all over. Why live? I light the candle – my huge shadow springs across half the wall, clear up to the ceiling and in the mirror over the fireplace I see the face of my own ghost. No one in art has yet penetrated as far [as Dostoyevsky into the mystical realms of the soul, towards the metaphysical, the subconsciousness, viewing the external reality of the world as merely a sign, a symbol of the spiritual and metaphysical. My ideas developed under the influence of the bohemians or rather under Hans Jager [leader of the 'Kristiania Bohemia' since 1883]. Many people have mistakenly claimed that my ideas were formed under the influence of Strindberg and the Germans.. ..but that is wrong. They had already been formed by then. One sunny spring day I heard the music coming down Karl Johan [street] and it filled me with joy. The spring, the sun, the music, all blended together to make me shiver with pleasure. The music added colour to the colours. I painted the picture [his painting 'Music on Karl Johan'] allowing the colours to reverberate with the rhythm of the music. I painted the colours as I saw them at that moment. Behind the top hats, a little lady wearing lila-coloured tights was balancing on a tightrope in the middle of all that blue-grey tobacco-laden air. I sauntered in among the standing clientele. I was on the lookout for an attractive girl. Yes – that one wasn’t bad. When she became aware of my gaze her facial expression changed to that of a frozen mask and she stared emptily into space. I found a stair – and collapsed into it – tired and listless. Everyone clapped. The Lila-clad tightrope-walker curtsied, smiled and disappeared. A group of Romanian singers took her place. There was love and hate – and longing and reunion – and lovely dreams – and that soft music melting together with the colours. The melted notes became green palm trees and steely blue water floating in the blue haze of the room. An artwork is a crystal. A crystal has a soul and a mind, and the artwork must also have these. The strange light illuminated all those night-time meetings that took place in every imaginable sort of café; the lips mouthing defiant words, heedless of restraint or consequence, often overbearing and brutal as only Norwegians can be, vast shadows of impotence misery and shabbiness – spirits training for fulfillment, striving in vain to be great, complete, unique. [Munch describes the environment and atmosphere of the Norwegian bohemia in Kristiana, where he himself lived and worked when he was about 23] And at the center of all the faces there would be Jaeger, whose logic was as sharp as a scythe and as cold as an icy blast.. 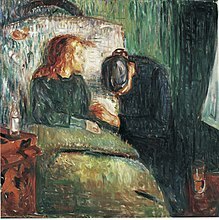 The only influences in [the painting 'The sick Child', Munch painted in his elderly home, remembering very accurate the last days of his dying little sister Sophie] 'The sick Child'.. ..were the ones that come from my home.. ..my childhood and my home. Only someone who knew the conditions at home could possibly understand why there can be no conceivable chance of any other place having played a part – my home is to my art as a midwife is to her children.. ..few painters have ever experienced the full grief of their subject as I did in 'The sick child'. It was not just I who was suffering; it was all my nearest and dearest as well. One evening I came to have a discussion with my father on the subject how long unbelievers are tormented in Hell. I maintained that no sinner could be so guilty that God would let him suffer longer than a thousand years. Father said that they would suffer for a thousand times a thousand years. We would not give up the argument. I became so irritated.. .I returned home to make my piece with him. He had gone to bed so I quietly opened his bedroom door. He was on his knees in front of the bed, praying.. .I closed the door and went to my own room but I could not get to sleep.. ..eventually I took out my drawing block and started to draw. I drew my father kneeling by his bed, with the light from the bedside lamp casting a yellow glow over his nightshirt. I fetched my paintbox and colored it in. Finally I achieved the right pictorial effect, and I was able to go to bed happy and slept soundly. 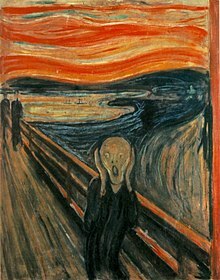 Grey dawn was seeping into the sick room [around Christmas 1867, Munch was almost dying then and spitting blood when he was 13; but he recovered]. I lay in the middle of the bed with my hands outside the bedclothes, looking straight ahead. Now I was in a pact with God. I had promised to serve him if I survived, if he allowed me to escape the tuberculosis. Now I could never be as before. death – as eternal as longing. My afflictions belong to me and my art - they have become one with me. Without illness and anxiety, I would have been a rudderless ship.. .My art is really a voluntary confession and an attempt to explain to myself my relationship with life - it is, therefore, actually a sort of egoism, but I am constantly hoping that through this I can help others achieve clarity. What is art really? The outcome of dissatisfaction with life, the point of impact for the creative force, the continual movement of life.. ..in my art I attempt to explain life and its meaning to myself. The creator of the 'Frieze of Life' was almost blind [in 1938, when Hodin visited Munch]. He had completely lost the sight of one eye a year before through the bursting of a blood vessel that flooded the eyeball, and now the other was threatened in the same way, as a result of one of the severe illnesses which had so often endangered his life. The seventy-five-year-old artist had for months been confined to his sick bed, unable to lift a finger to give the much desired finishing touches to the vast edifice of his life’s work. Hodin had met Munch during 1938, a year after the retrospective exhibition at the Academy of Arts in Stockholm. Hodin described this meeting in his essay 'The Forerunner'.